After the Civil War, America's population growth swelled like a tsunami with boatloads of immigrants arriving, it seemed, on every ocean wave. 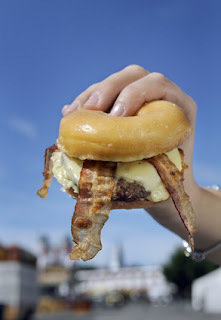 Even more pressing than the need to heal the masses was to keep them fed, but demand coupled with greed, allowing quackery to become pervasive in the food industry, just as was happening in the medicine industry. 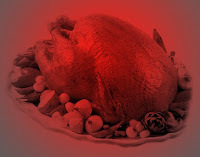 Just about every type of food had problems attributable to new methods or slippery salesmen. Tin cans had been invented primarily for long-term storage of food used in ships, but imperfect canning procedures and lead-based solder tainted contents; an entire Arctic expedition was lost because of the lead that had leached into their canned foods. When desperate, starving crewmen realized the canned food was killing their shipmates, some resorted to the only other food left - each other. While the world was unaware of what happened to that lost expedition, concern about poisonous tin cans was already being expressed in the newspapers, giving the alternative Mason jars a boost in popularity. A new reform movement, the Society for the Prevention of Cruelty to Animals, exposed the public to the practice of bleeding calves days before being slaughtered so that the meat would be white. The calves were sick for days before being slaughtered, "so weak they cannot stand, cannot bleat." More women were now working outside the home, leaving their babies to be fed with bottles full of cow's milk. Some dairy farmers watered down their yields of cow's milk and then added chalk for coloring. Communities instituted milk statues forbidding the sale of milk produced by sick or diseased cows or which had been adulterated with any foreign substances, but complaints continued to roll in. One newspaper joked sarcastically that milkmen were leaving at the back door bottles of water that had been slightly adulterated with milk. Even candy for kids was being adulterated for more profit. Terra Alba, or white earth, was being used instead of sugar because it was cheaper and gum drops sometimes got their chewy consistency from glue instead of gum arabic. "Poisons are much cheaper than genuine extracts," one paper pointed out, so prussic acid was used in place of almond flavor and pineapple flavoring was being created from the blending of rotten cheese and nitric acid. 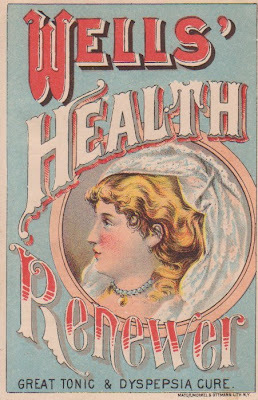 Food product labels began to be emblazoned with such promises as "wholesome," "fresh," and "unadulterated" because it had become such a big concern to the Victorian homemaker. She and/or her hired help made most of the family's food from scratch, so the quality of the ingredients - or at least the promise of quality - had become an increasingly important issue. When she baked bread, one of the most frequently made foods in the Victorian home, she wanted to use real flour (not flour mixed with sawdust, as was sometimes the case) and quality yeast. The yeast meant everything to the success of the bread. Bad yeast made bad bread and wasted time and money. After all of the mixing and preparation of the bread ingredients and kneading the dough, the bread was often left overnight under a towel, for the miracle of the rising of the dough to occur. In the morning, the homemaker's hope was to see her towel looking like it was levitating in air because of the dough that had taken life from the yeast, rising and forming into a handsome loaf. With this context, it's not at all strange to see a patent medicine maker also offering yeast. Hubert Harrington Warner was an extremely successful businessman with a shrewd appreciation for the power of advertising. His first business success was in the manufacture and sales of safes. 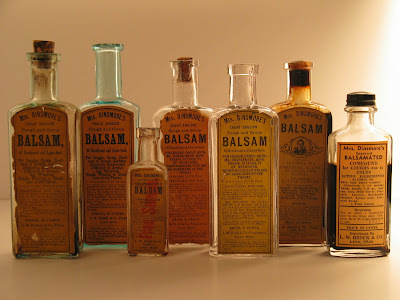 He sold that business and then started a multi-million dollar patent medicine business, Warner's Safe Cures, with the safe as its trademark as well as its central message: whatever the medicine, if it's made by Warner, it's SAFE. The public latched on to his message and made him very, very wealthy in the 1880s. 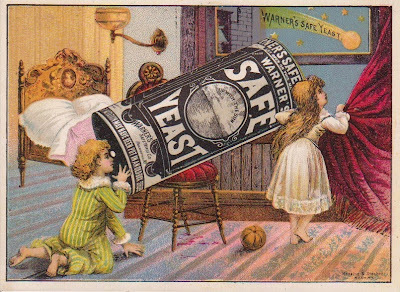 He applied the same trademark and message to his Warner's Safe Yeast product. His advertising promised the yeast was made "with the greatest care, without the touch of the human hand from mixing vat to packing case." "Warner's Safe Yeast is guaranteed to be an absolutely Pure Dry Hop Yeast, and bread made with it will remain sweet and moist for many days. Be sure and insist upon getting Warner's Safe Yeast, the price of which is no more than the cheap and impure Yeasts with which the market is flooded." 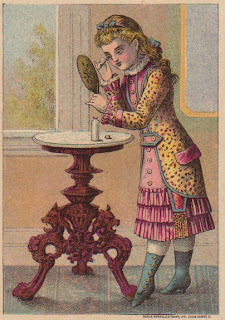 Warner product advertising was found in newspapers and periodicals throu ghout the country, as well as in almanacs and trade cards. 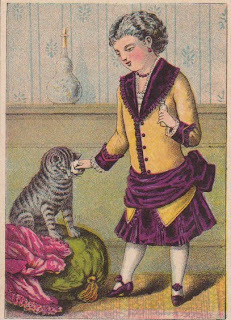 Two of those trade cards are shown here. They are fantastic custom-designed cards, employing the package of Warner's Safe Yeast to be not only at the center of visual attention, but symbolic of providing safety to the humans around it. 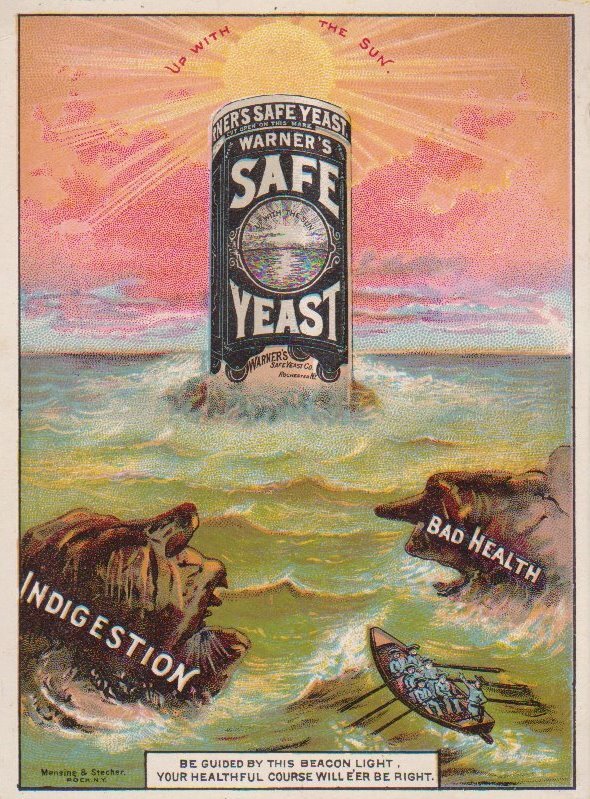 In glorious color, the first image shows the cardboard canister of Warner's Safe Yeast rising from the ocean, providing a lighthouse-like beacon to the small rowboat of shipwrecked sailors. These tiny humans (lower right corner) are dwarfed by the rough ocean and the dangerous rock outcroppings that lay ahead. The artist arranged those rock formations to have scary faces and painted messages of INDIGESTION and BAD HEALTH, but the didactic message is clear as is the sailor's escape from sure death: they will gain safe passage by heading for the Warner's Safe Yeast. Over the lighthouse we read the product's slogan, "Up With the Sun" - just what the homemaker hoped to see when she went into the kitchen at dawn - to find the levitating towel. The second, equally eye-catching image shows two little children in their room, thrilled and amazed at one of the comets that filled t he Victorian night sky. Their Warner's Safe Yeast canister is serving this time as a telescope which allows them to view the comet from the safety of their own room. It is also, therefore, the instrument through which they can see the light: Warner's. In both trade cards the product promises both safety and light; Warner's is the lighthouse producing the light and the light in the sky (the comet). Don't be afraid of bad yeast - just use Warner's! Safe food, safe medicine - it's what we all want - and it's the promise that made Warner one of the most successful quacks in the 19th century. Have a Happy Vitapathic Thanksgiving! As you sit down to enjoy your wonderful Thanksgiving dinner, you may want to consider starting a new tradition: the Vitapathic Blessing. Food at the table, just before we eat it, can be vitalized by the VITAPATHIC BLESSING, as practiced by all good Vitapaths in their families at the commencement of every meal. All ... prayer is vain. Take is the only successful method of prayer; if you want air take it, if you want drink take it, if you want food take it ... if you want life, take it and LIVE. a long pull and a strong pull altogether, and thus take in vital spirit enough to vitalize oneself and each other, and to vitalize the food on the table, thus benefiting each and all. This breathing of vital spirit to increase soul power is more essential than eating food to increase bodily power, for the soul is more important than the body. That's fine, but when your deeply inhaling the aromas - I mean the vital spirit - of the food in front of you, better keep one eye open for Uncle Louie - he's got his fork in his hand and I think he's gonna cheat. Give me a "V"! Give me a "D"! Whadaya got? VD! Now there's something to tack to the end of your name! Dr. Oliver Bliss (see the blog post of 11/22/09) listed himself as an "electric and vitapathic" physician in the late 1880s. Odds are, then, that he went to the American Health College in Cincinnati to get his V.D. degree - Vitapathic Doctor - not what you were thinking! Vitapathy was the self-proclaimed culmination of John Bunyan Campbell's life's work as a doctor. By his own account he had started as an allopathic (conventional) doctor, then studied and practiced the whole gamut of 19th century medicine: botanic medicine > eclecticism > homeopathy > electricity > hydropathy > mesmerism + magnetism + psychology + clairvoyance + spiritism + spiritualism + mental healing + Christian Science + metaphysical treatment + statuvolence + psychomancy. He basically took what he wanted out of each method and formed his ultimate healing method, Vitapathy; as he put it, the rest "are but ... single spokes in the full wheel of Vitapathy." American Health College did not have a football team because school wasn't in session long enough; the whole course of study was three months. For $100 tuition, students got a copy of Campbell's book on Vitapathy and an electro-magnetic battery he called the "Little Giant," and three months of instruction, not on anatomy, physiology, and medicine, but on Vitapathy. "Spiritual Vitapathy is an entirely new system of health practice," Campbell explained, "it is an entirely spiritual system, and employs only spirit and spiritualized remedies for the cure of disease leaving all drugs and so-called medicines behind ..." thus eliminating the need for CVS and Walgreen. Campbell had discovered vital spirit, sort of like the cosmic life force, in all things: air, water, food, heat, light, electricity, etc., and Vitapathic minister-physicians (VD's for short), were trained how to draw that stuff out and inject it into the sick and weak. In addition to healing the sick, a VD was fully authorized to preach the gospel of life (Vitapathy), minister over funerals, solemnize marriages, commune with angels, and cast out devils. 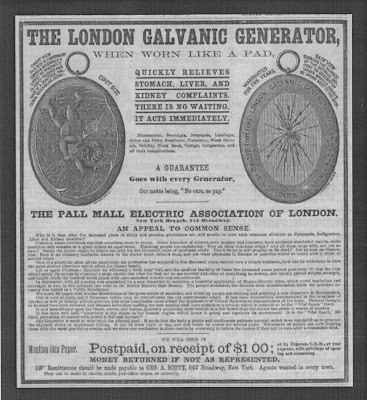 The VD's could infuse the Vita into letters they wrote, handkerchiefs, or stockings and the sick who received them, though miles away, could wear those items and get better (yup, he even told the ill to "wear [the] magnetized letter on the part of his body diseased as long as the letter will last and this will keep up the connection between doctor and patient and a continuous treatment, and they will be much benefitted.") Vitapathy was such strong mojo, Dr. John Bunyan Campbell said it could even raise the dead and make a person immortal; personally, I think he got those tall tales from the Bunyan side of his family. As you might expect, conventional doctors also took a few choice cracks at Dr. Campbell and Vitapathy. One said his book was "intended for the household use of the quack in petticoats" (meaning gullible women who looked after their family's health) and that Campbell was "nothing but a daring fakir, to whom vitapathy ... is a source of revenue." Another critic said most of his students were "ignorant dupes, illiterate dunces and mental imbeciles." Ouch. 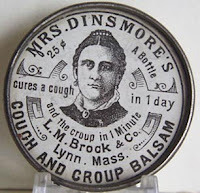 Dr. Bliss was a vitapathic doctor, but his card also directed consumers to some medicines of his own making (which was anti-VD doctrine), so he was apparently adding one more spoke to his medical wheel - and the wagon of quackery just kept on rolling. Would you use Dr. Bliss or Dr. Coffin??? In my research I have come across doctors with some pretty unnerving surnames. The oddest one was probably a Dr. Lummus who voluntarily changed his name shortly after becoming a doctor to Dr. Coffin. It was his mother's maiden name and there were reasons that changing to her surname made sense to him, but it had to give his patients pause. "Hi Doc Lummus, I'm feelin' kinda sick. Can I come over to see you?" "Oh, I've changed my name; I'm now Doc Coffin. How badly do you feel?" I'm certain that if I knew two doctors who seemed equally capable and one was named Dr. Coffin and the other was Dr. Bliss, I'd probably being going to Dr. Bliss. 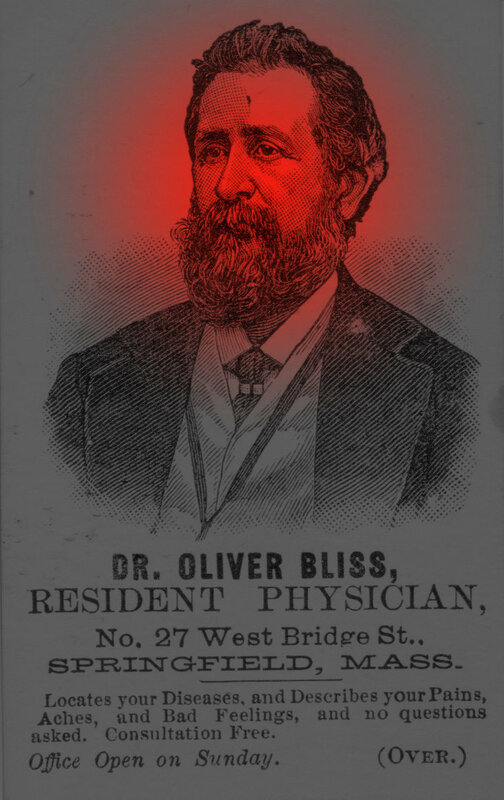 Well, Dr. Oliver Bliss of Springfield, Massachusetts wanted potential patients to know that he had even more going for him than his comforting name. His little business card tells a bigger story than its size would suggest. I'll go over it in the order that the reader would. 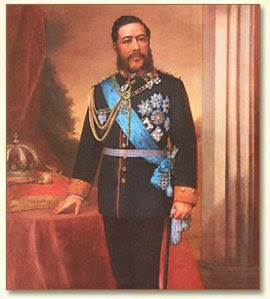 First, his portrait: it is very much part of the message - perhaps the central message - of the card. Although subliminal, it is very much meant to be read as much as the text. It is carefully rendered to give customers comfort. This well-groomed, well dressed, middle-aged man is the picture of wisdom, sobriety, knowledge, and confidence. In addition to looking self-assured, his expression is serene and reassuring, none of the body language that would intimate anger, confusion, doubt, or deception - you're in good hands with Dr. Bliss. There is an interesting dark ribbon in a v-shape over his vest, suggesting that he might be wearing a medallion of some honor or merit that he might have earned in his medical mission to suffering humanity (wearing such ribboned medals was very popular distinctions in Victorian America). Now it gets really interesting. The first thing we learn about this august, conventional-looking doctor is that he promises he "Locates your Diseases, and Describes your Pains, Aches, and Bad Feelings, and no questions asked." How? Doesn't say. But if he could do that, he must be really good, huh? He was essentially making claim to some sort of psychic connection that precluded his need to ask questions - possibly through clairvoyance or mesmerism - but he was probably just a shrewd and perceptive judge of patients' aches and pains. 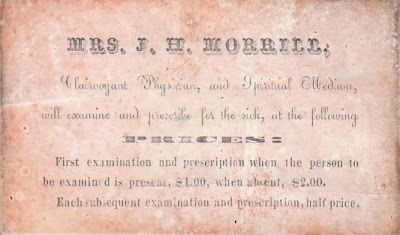 The back of his card further explained that he made a specialty of several illnesses: chills and feaver (as it was spelled on the card), rheumatism, neuralgia, and piles. 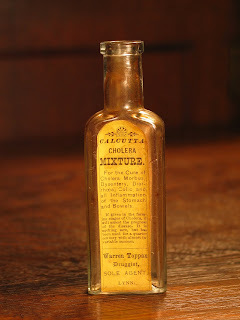 He shows his colors some more by revealing that he cured dyspepsia with "no quinine, no mercury, but pleasant, and purely vegetable compounds," and consumption and hemorrhages "that defy the skill of old practitioners." Thus he was separating himself from the regular or conventional doctors that resorted to those medicines. Dr. Bliss was claiming to have found better methods than the standard physician and he was letting the public know he was proudly different and successful. 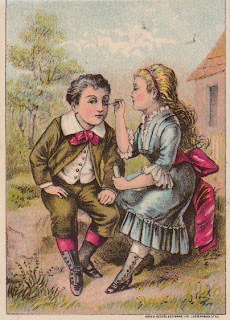 The card back also gives short puffs for two of his own medicines, Golden Whooping Cough Syrup and Electro-Magnetic Powders for female complaints. Whether he was mortising together or morphing through clairvoyance, mesmerism, magneto-electricity, vitapathy, eclecticism, steam baths, and proprietary medicines, Dr. Bliss used a hodgepodge of alternative methods in just an eight-year period of time, but he quacked quietly on his trade card, calmly assuring potential patients that he was as good as his name - it was a lot to live up to. 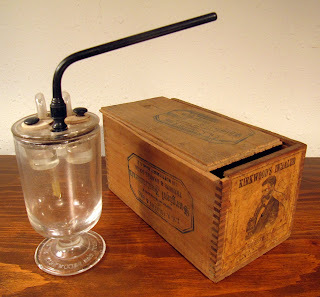 More on electric, vitapathic, and eclectic healing in future blog posts of Quack Cogitations! 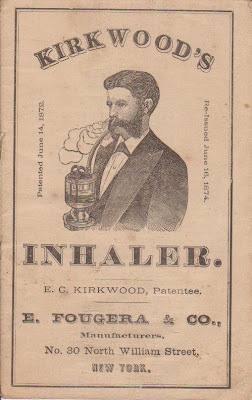 "Are you of the Opinion, James," asked a slim-looking man of his companion, That Dr. Smith's medicine does any good?" "Not unless you follow the directions." "Keep the bottle tightly corked." Full soon would knock it under. And with the gripes would wrastle. In this and other nations. The hatchet & the cleaver. These modern days, is carving. Doctor (cuttingly) - Are you to be allowed to drink bear, eh? Didn't I tell you just a week ago to let the stuff alone? Patient - I know, doctor; but, you see, I thought there might have been some progress in medical science since. "Your wife has a muscular affection which renders her speechless. I can cure her, but it will take time." "Take all the time you want, doc," responded the mean man. A Wester paper speaks of a man "who died without the aid of a physician." Such instances are indeed rare. "The doctor said he'd have me on my feet in two weeks." "He sure did! I had to sell my car to pay his bill!" Pat - "The doctors say O'Brien is afflicted with 'rheumatorial arthritis,' whatever that may be!" Mike - "Oh, that's Latin for 'Mrs. O'Brien," I imagine!" The Atchison Globe says that when Rip Van Winkle awoke from his long snooze he consulted a physician. And the physician told him what he needed was a good rest. A sick man inquired of a friend whom he should consult, and was recommended to an eminent specialist. "Is he very expensive?" asked the patient. "Him? No; he'll charge you $5 for the first visit, and $2.50 afterward." So the invalid went off to the doctor in question, and upon being admitted to the consulting room slammed down $2.50, accompanied by the remark: "Well, doctor, here we are again." The doctor calmly picked up the money, opened the drawer in his desk, placed it therein, and locked the drawer. The patient waited events. "Well, aren't you going to examine me? he said at length. "No," said the specialist; "there's no need to do it again. Just keep on with the same medicine. Good day." Mrs. Hudson and I hope you have a great weekend and a smile on your face. New 4-minute video on the History of Quackery! I have added another attachment to my "More Fascinating Quackery" sidebar on the right that I highly recommend to you. It was produced by England's world-famous Wellcome Library and shares delightful, interesting images and narration. Definitely check it out! Bravo, Wellcome! A note from QuackMD - I was delighted to receive such positive responses of interest about Sleeping Lucy; I'm glad you enjoyed that information! Please keep in mind though, folks, you can even more easily post a comment right on the blog rather than have to send me private emails! Having said that, let me now tell you about Mrs. Morrill, another clairvoyant healer and one of Sleeping Lucy's Vermont neighbors. She wrote to the Risleys, her New Hampshire friends, that she suffered from "humor in the blood" and "apoplex shock." She suffered a particularly severe shock just three days earlier. "I thought my days wer finished," she dictated to her secretary. She told her friends she would not be able to visit them, but if they could visit her, then "do not fail to come it may be the last interview we may ever have." Her decline had been rapid. "A year ago my health was such that I walked the distance of a mile a few times and could get out and in to a wagon nearly as well as ever now I am so dizzy and weak I can scaresly perform the task and I am seldom able to walk to our nearest neighbor the distance of ninety rods (less than a third of a mile)." The letter was written on July 29th, but subsequent short postscripts were added on July 30, 31, August 1, and 3. The next to the last postscript was ominously, "I am aware that my strength daily decays"
Ironically, even though she made great efforts to explain to the Risleys how sick she was, M. Quimby said she wrote the letter to tell her friends about the good benefit she had received from a clairvoyant physician. She didn't think the healer's instructions would cure her, but they at least made her feel a little better. 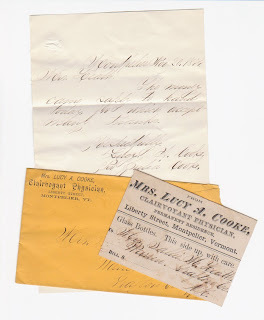 She believed that Asa Risley was suffering from the same set of problems she had, so encouraged him to follow the instructions she had received from the clairvoyant and also included the healer's business card, just in case he wanted to visit for himself. Quimby then briefly recounts her fascinating visit to Mrs. J. H. Morrill, the Clairvoyant Physician and Spiritual Medium, who was just 40 miles away from Sleeping Lucy's stomping grounds. Like Sleeping Lucy, she was both a clairvoyant and a medium, meaning she could reveal problems of health, wealth, or love, solve business problems, and help find lost treasures or hidden criminals. "I went about three miles to see this lady we went into a retired room she sat down shut her eyes and in a moment or two she says you have suffered a great deal she acted and told me my complaints as to appearance as plain as you could disern anything with your naked eye then She began to direct me how to precede with my self and then prescribe the medicine - which I find makes me more comfortable while I live." "when you rise in the morning before dressing have a pan with a little warm suds made of Castile soap set your feet in it taik a large cloth Squeeze it out in the suds rub your head and neck get some one to rub your back thoroughly keep the cloth warm with the suds then rub the whole system till the skin looks red feet and all for a change ocationaly take a damp cloth & sprinnkle on mustard or Cayenne rub the whole system thoroughly with that Drink no sale coffe drink domestic coffee if you wish drink allittle tea to keep your spirits good let your food be vegetable much as you can eat no warm bread of any kind shun all pastry and biscuit eat a little Brown bread or very light wheat bread crackers suit me best make no use of salt vituals nor any thing sour nor pepper drink no cold water"
It is interesting to note on Mrs. Morrill's card: "First examination and prescription when the person to be examined is present, $1.00, when absent, $2.00." Since she was a clairvoyant, she didn't really need the person to be in front of her to know what was wrong with them. Asa Risley could just send his two bucks in the mail instead of having to travel over the river and through the woods. Didn't even need the Internet. I have always had a special place in my heart for clairvoyant healers. I don't really know why, but I think it has something to do with how they dabbled in mental telepathy, astrology, numerology, and other shadowy subjects which feel forbidden but fascinating to me. They were able to control two worlds at the same time. Upon being mesmerized (i.e., hypnotized), they were are able to keep their patient waiting breathlessly as they sank into an unconscious world to find the cure; when I try it, I just sink to sleep. 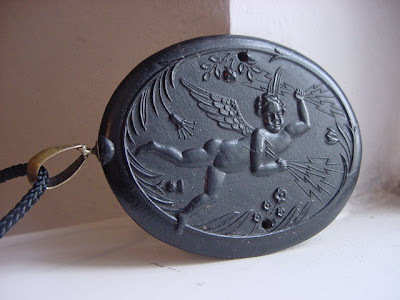 There were bunches of these mystics in the 1830s and 1840s especially, honing their skills in mesmerism (it was also called animal magnetism); then in 1848 the Fox sisters took clairvoyance to the next level by introducing the living to the world of angels and ghosts and Great Grampa who died 52 years ago. In the 1830s and 1840s, it was a little bit simpler. People looking for cures that their regular doctors couldn't give them often tried "the next new thing" in desperation - and one of those new ideas was clairvoyant healing. I have a few such healers to tell you about, but today I want to highlight Lucy Ainsworth Cooke, known in her day as "Sleeping Lucy." You see, one of the key formulas for the success of a nineteenth century healer or medicine seller was to have a near-death experience, followed by a miraculous recovery, finished by a pure desire to share their miracle with fellow sufferers. So our young heroine Lucy was on her sick bed for several months, "given over to die by three physicians," but finally, falling into an unusual sleep, in a dream-like state, a "suggestion" came into her mind to heal herself using certain roots and herbs prepared in a certain manner. She had not spoken aloud for six months, but when she awoke she was suddenly able to call aloud for some friend, requesting the roots and herbs and explaining how to prepare them. And guess what happened? She was cured and arose from her death bed!! Shocker. 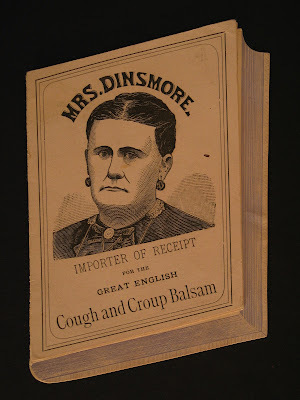 She then resolved "to commence life anew by a constant study of disease and cure." She repeatedly experienced inner visions in her sleep and would awake speaking some mysterious instructions to the benefit of someone who had asked her for assistance. Sometimes the inner voice gave clairvoyant instruction to find a missing purse or to help the sheriff solve a crime; it even revealed where Captain Kidd had buried a chest of gold - deep in Vermont's countryside (although no gold has been found there yet). 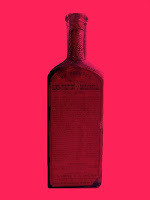 Most of the mysterious messages told her and her patients what cures they needed to get well: cordials, panaceas, syrups, liniments, salves, tinctures, powders, plasters, rheumatic pills, bitters, cough lozenges, diaphoretic drops, rose ointment, "R. W. Bitters," and golden ointment - she wasn't a clairvoyant healer, she was more of a clairvoyant pharmacy. 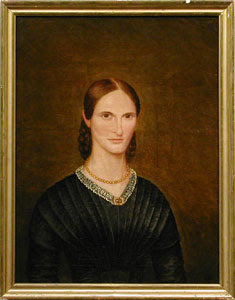 Lucy married Charles Cooke who had been her magnetizer (the person who would put her into an hypnotic trance) for two years, so that her clairvoyant voice could pronounce miraculous instructions. And thus she became known as "Sleeping Lucy," the clairvoyant healer. One of her brothers also looked to medicine to make a few dollars. Luther Ainsworth became known as "Doc Ainsworth" even though he had no medical school education. 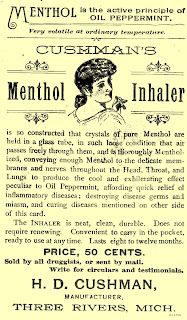 He was remembered for prescribing buckshot as his panacea for "all human ills." Buckshot was supposed to make the patient immune to further illness - by being swallowed, not by being shot from a gun. If the United States is going to have its health care services run by the same yahoos running our Post Office, we're gonna have a lot of sick, angry people in this country! As you can probably tell, I just spent an hour and ten minutes in a line at the post office today to get to do three minutes worth of business. Grrrrrrrrrrrrrr! Now I know where and why terrorist cells get started!! "... there are myriads of living creatures swarming around us, each one framed with the nicest skill - each endowed with capacities of enjoyment - each having some service to perform in creation ... Yes, - every tiny leaf, every drop of water, is a world in which multitudes of God's creatures are born, with frames of workmanship as curious and as wondrous as ours; and there they live and sport with evident enjoyment throughout their little day, fulfil the end of their tiny being, and then give way to new generations." "Looking through a powerful microscope at that tiny drop, we may see creatures of shapes like those depicted there, and many more besides ... Even for the pleasures and the needs of beings such as these, whose universe is a drop of water, God provides; and shall He not care for us?" 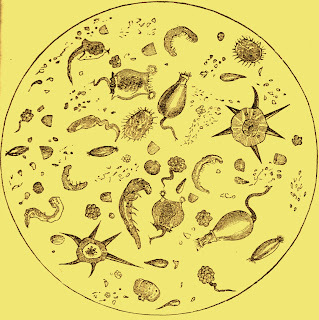 Today, 151 years later, man is working really hard to overcome his child-like fascination with the inhabitants of worlds both infinitesimal and celestial; as a species we seem to be diminishing the significance and even the existence of a God we cannot see and eliminating the existence of micro-organisms that we cannot see without the aid of microscopes, which few of us ever use. We look to the Lilliputian creatures of the water drop as the enemy that they often are, and take all kinds of modern, scientific measures to blow them out of the water, so to speak. Kleenex brand tissues are currently available in a variety that promises to kill 99.9% of all cold and flu viruses. They reinforce this lethal message with consumer packaging that shows cartoon versions of the creepy-crawlies that Isaac Dowd Williamson found in his 1858 microscope. They are no longer the creatures of wonder over which Williamson marveled because now Kleenex kills 'em dead. 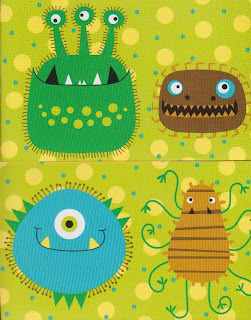 The comforting lesson of the good minister has been twisted into a new conundrum by modern science, and that is, if we can so quickly and easily and completely destroy those little "pigmy insects" because they are so troublesome, will God soon eradicate the troublesome human life forms on planet Earth with His giant Kleenex? 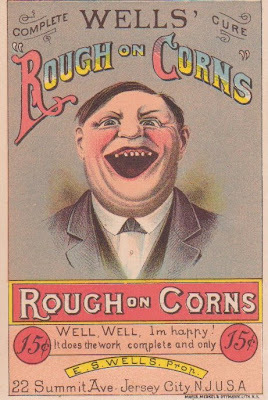 I am very fortunate to have a wonderful collection of things to do with quackery: bottles, trade cards, broadsides, billheads, letters, diaries, and so on. I think the letters and diaries are among my favorites because they are very personal and heartfelt, often intended to be read by only the writer, in the case of diaries, or the person being written to, in the case of letters. So today I am going to share with you one of my favorite letters; I hope you'll enjoy it. I am in the village of Adams in good health but low spirits attempting to get a living by the practic of my profession, which is of all others the most contemptable in this place. The medical faculty of this plac consists of five besides myself and they are a strange mass of Drunkardness infidelety quackery and foolishness as was ever met with. They are a disgrace to the profession and a pest to society. Still the people after being duped and gulled by this professional kind of a nondescrip will employ them because they can pay them in whiskey which makes it rather small business for those that dont drink it. I understand you have been to Michigan I hope you have found a place for me as I am Sorely sick of this. It will be a great while before I Shall do enough to support myself beside my debts which I Shall never pay if I have got to earn the money by the practice of medicine in this place - There is six physicians to 12 or 1500 inhabitants. The ride is very much circumscribed there being physicians all around us within four or five miles. Mr Hunt please write me a few lines as soon as convenient and give me a history of your town and your opinion of Michigan. Likewise give me your opinion as to what I had better do as I shall Starve here. Give my respects to the people at Herkimer. It's a fantastic slice of history, but alas, only a slice. I wish I knew what happened to the good doctor; perhaps I will someday with more research and time. If any of you know anything about him, please let me know! 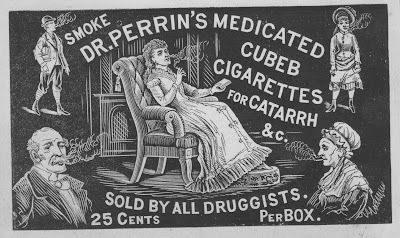 Of course, what I'd really like to know more about is those quacks that made Doctor Shephard's life so miserable! 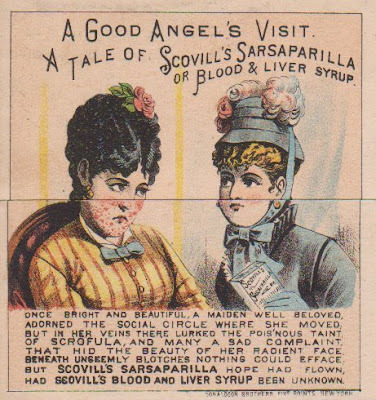 Well, without doing so on purpose, it seems I have strung together something of a story line by which to share some of the quackery going on in the 19th century. 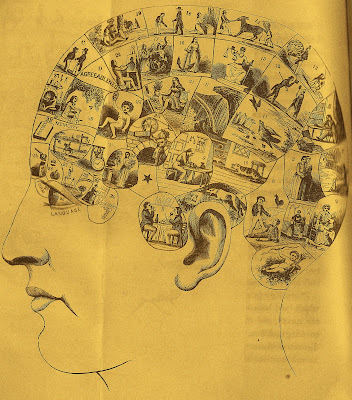 It started with my hypothetical story of a young man who used phrenology as a means to find the perfect woman. 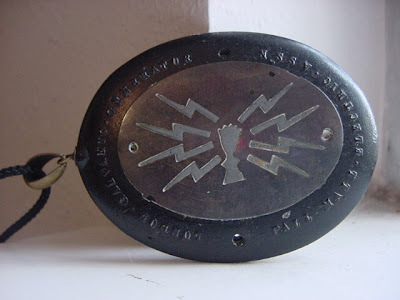 His phrenologist was able to find the perfect match, then the young man bought his soul mate a love token in the form of Galvanic Generator pendant and wondered if the matchmaking phrenologist got his analysis right. We then saw the lovely young woman, restored from dyspepsia and nerves, looking lovely in her wedding trousseau, ready to get married. That brings us up to the day before Halloween, when I shared an image of the groom, proving conclusively that love is blind. Today it seems fitting to transport you to the first scene of our newly married couple's domestic bliss. The wife has set the tone for their marriage by rewriting the Ten Commandments. 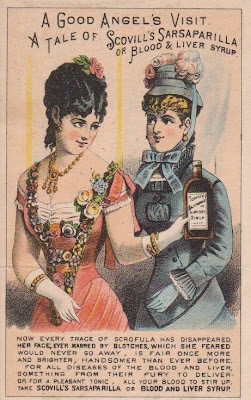 In that this great trade card (or possibly a small blotter) has survived almost infers that someone appreciated its wit (or its wisdom) enough to preserve it; I choose to imagine that person was our bride. I love the fact that the "Wife's Commandments" required fifteen immutable laws when God only required ten. The ground rules have been laid and our groom has his work cut out for him! It is also interesting to consider the issues of nineteenth century married life that underlie these commandments. 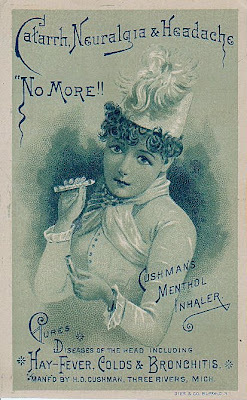 The first, for example, makes it clear that the husband is not to entertain any notions of becoming polygamous, which was being actively practiced by the Mormons, and roundly excoriated by their critics, in the 1870s and 1880s (the time period during which this when this advertising piece was made). The second rule is another sexual taboo for the groom that infidelity will not be tolerated with household servants or nursemaids - another common concern and suspicion among the middle and upper class matrons who so frequently had female (and often foreign) servants living in the home with them and their husbands. 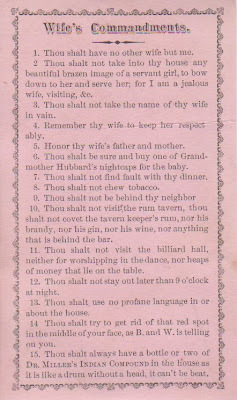 Commandments 8 (chewing tobacco), 10 (alcohol drinking and tavern visiting), and 11 (billiard halls and gambling) were all designed to have the husband continue walking a straight moral path, bringing honor to the family and ensuring that he stayed employed and also did not squander his earnings. Number 14 most likely repeated the commandment about avoiding liquor (the red spot on the middle of his face referring to the red nose of a drunkard), but for the life of me, I have no idea who "B. and W." is or are (if you have any idea, please let me know!) The other commandments would require the man to be a dutifully respectful and attentive husband, father, and son-in-law. Then we have Commandment No. 15 - the Great Commandment, I would suspect we are to believe. By this point in the list, the browbeaten husband has been pummeled into submission and would presumably acquiesce to this commandment as a final act of submission. I sure hope this humbled husband knew where to buy Dr. Miller's Indian Compound; I have tons of reference books and lists, but have been unable to find any quack medicine by that name in the nineteenth century. And for his sake, it better not contain alcohol, or he's never going to hear the end of it from his new wife!